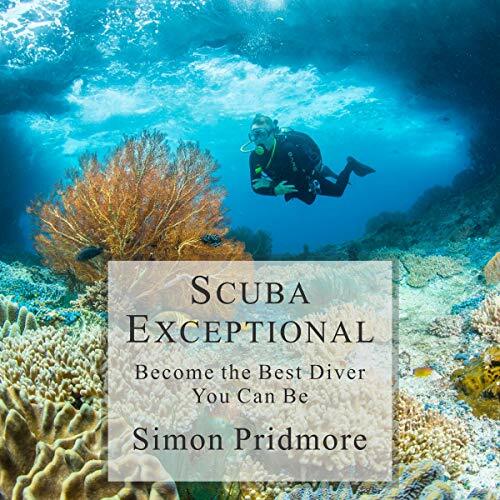 Scuba Exceptional may be the fifth in Simon Pridmore’s Scuba series, but it is the true follow-up to the first book in the series, Scuba Confidential. Scuba Exceptional reflects the same philosophy of safe diving through the acquisition of knowledge and skills. The themes are new, there are some wonderful and extremely useful new cautionary tales, and the focus this time is more on issues that face experienced divers. For example, there is more technical diving content, but, as usual, Simon covers complex issues in his usual clear and easy-to-listen-to style. In many cases, the concerns of technical divers reflect those of scuba divers at every level. After all, as he says, technical diving is on the same spectrum as conventional sport diving: It is just a different frequency. While most of Scuba Exceptional focuses on the diver, it also takes a look at the wider picture and highlights a number of areas where scuba diving professionals and the “industry” as a whole are letting divers down. As always, Simon is realistic in his assessments. He may shine a little light on the dark side of the scuba diving world, but he does this in order to illuminate bad practice and encourage change while offering solutions. He also provides insights on a wide range of topics. What makes someone a good diver? How to swim against a current without getting exhausted? How you can be out of air while you still have plenty to breathe? What the concept of failure points is? How to be a defensive diver? How preconditioning applies to scuba diving? How long you should really wait between diving and flying? When to call DAN (and when not to call)? How corals could possibly be animals when they look like rocks? How to avoid being left behind in the ocean? What the perimeter of ignorance is? Scuba Exceptional has the answers to these questions and a lot more.